Tue, Thu-Sat 12-8 and by appointment. 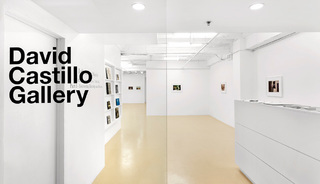 David Castillo Gallery opened in 2005 after transforming a dilapidated warehouse in Miami, Florida, USA into a 5,000 square foot gallery, project room and annex. The Miami New Times has pursuantly named it the best gallery of 2008. David Castillo Gallery is resolved to exposing emerging and mid-career artists, both local and international, whose concepts relate contemporary art to historically important work, particularly from Modern Art. The gallery represents an intentionally small roster of artists. David Castillo Gallery curates works in all media through gallery, group, and special project exhibitions. The gallery also encourages projects and shows curated by various curators from places as diverse as Berlin, New York, and Miami. In 2008, the gallery participated at Next Art Fair, Preview Berlin, and Art Basel Miami Beach. Works by gallery artists find home in major collections throughout the US and Europe, Asia, and Latin America. David Castillo Gallery has also placed gallery artists' work in museums, including significant New York and Miami institutions. Gallery artists have received recent reviews in the New York Times and been included in important catalogues of contemporary art, such as Painting People: Figure Painting Today and Vitamin D: New Perspectives in Drawing. David Castillo holds degrees in History and Art History from Yale University and the Angelicum in Rome. Since 2000, he has dealt in important Latin American, European, and American secondary market works. Castillo has additionally held positions at various museums, including the Yale University Art Gallery. Castillo continues to assist private clients in building their collections in addition to managing David Castillo Gallery.